Applications to perform & present are open! If your act is a solo, duo, trio, band, ukulele clubs, or a school group, we want you to get your applications in now. If you have amazing knowledge to share in playing or performing skills, accompanying instruments for bands, music theory, or even something on the technical side, we want to see your application now. 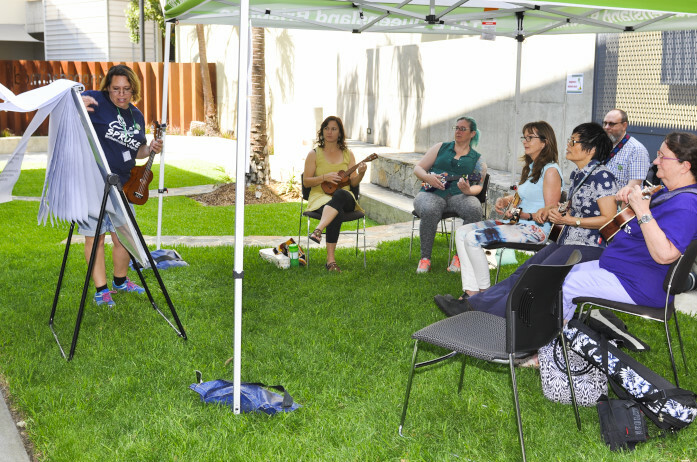 SPRUKE — Brisbanes’s Ukulele Festival is on 13-15 September 2019. We have a new venue for 2019 at Sunnybank Perf0rming Arts Complex (SunPAC) and the adjoining Sunnybank Sports and Community Club, which gives us some exciting new options for performing stages and workshop venues. This year SPRUKE features four concerts. A Sprooky Cabaret is on the night of Friday 13th to open the festival. Saturday features an afternoon Kidsspruke concert, and a Saturday night concert. Sunday the festival wraps up with the popular, all in, jamming Festival Finale. All in jam at the 2017 Morris Brothers Festival Finale Concert. Apart from scheduled performances over three stages we have added more open mic spots for walk up performances. 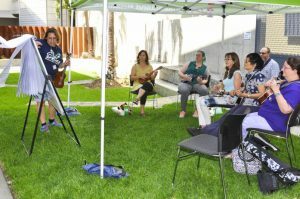 The Beginners Oasis with Ukulele Bootcamp, Jam-a-Long and Learn-a-Song sessions is also back. Learn a song, or have a jam at the Beginners Oasis. The theme of SPRUKE Festival is Uke’n Make Music. We’re looking for performances and workshops that inspire, as well as involve our audience in music making! Is there something you teach, or your group does, that will enhance our festival goers playing, performance or experience with the ukulele? Make sure you let us know! Some performing groups will be invited to lead the audience in jams. If you are great at this, make sure you tell us. There are separate forms for performances and workshops. All the info you need to prepare your application and the form can be found under the Participate menu. To submit an application to PERFORM please go to our Application to Perform web page. To submit an application to PRESENT A WORKSHOP go to our Application to Present a Workshop web page.